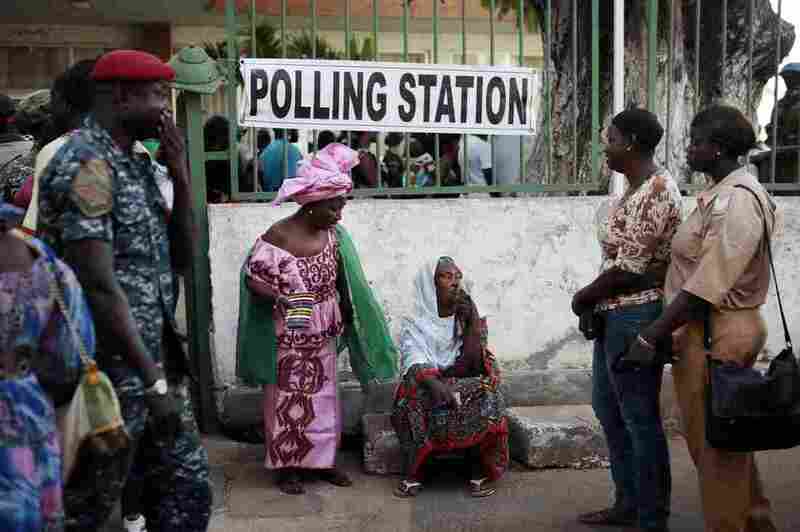 Gambians wait to cast votes at a polling station Thursday in Banjul. Gambians have cast ballots for a new president, in what marks the most serious risk yet to the decades-long rule of President Yahya Jammeh. 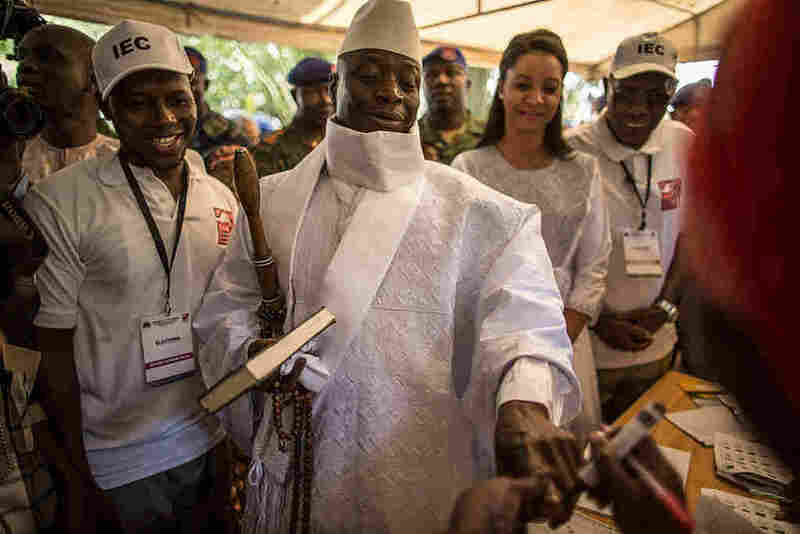 Incumbent Gambian President Yahya Jammeh (center) has his finger inked before casting his marble in a polling station during the presidential election. He is also known for “claiming to have a herbal cure for AIDS that works only on Thursdays” and proclaiming that he will rule Gambia for “a billion years,” as Reuters reports. His main challenger is businessman Adama Barrow, who has promised to “bring Gambia back from the brink and restore human rights and true democracy,” Ofeibea says. 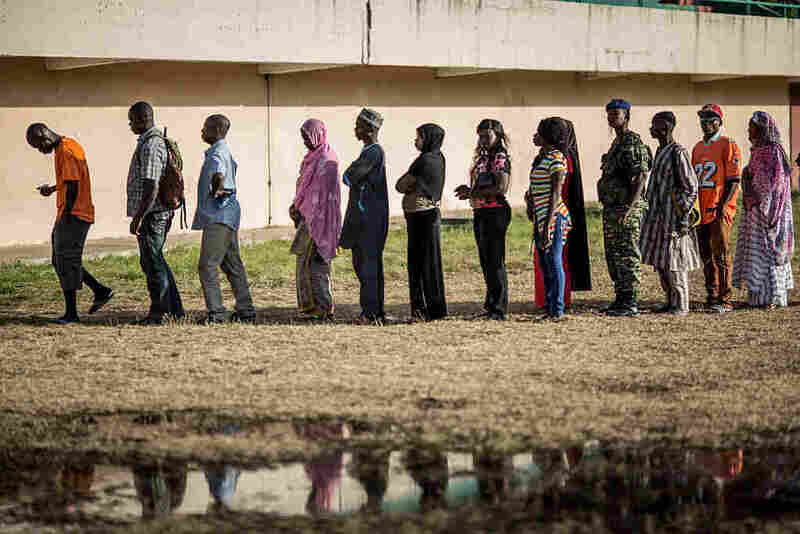 Voters queue at a polling station in Banjul during elections that pose the strongest challenge yet to the current president’s 22-year rule. Barrow has appeared to energize the opposition: An “unprecedented number of people turned up at opposition rallies ahead of the election,” according to the BBC. 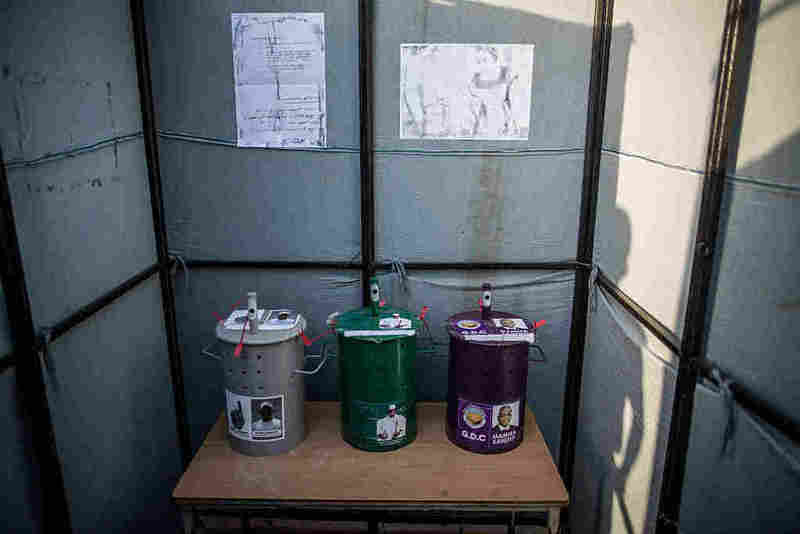 Voting drums with the emblem of the candidates in a Banjul polling station. Then, the voter deposits a marble into the drum representing a candidate. The marbles are then counted on a special tray. The BBC reports that Gambia has been using this system since the 1960s, saying that it is cost-effective and user-friendly. Gambia has also “not had a smooth transfer of power” since it gained independence from the U.K. in 1965, the broadcaster says. Authorities blocked the European Union from montoring the vote, Reuters adds, but allowed African Union observers into the country. Gambia made headlines when it announced in October that it was withdrawing from the International Criminal Court. As we reported, Gambia accused the court of bias against Africans.